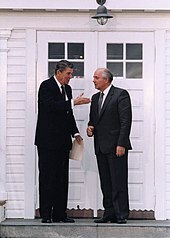 The government considered Gorbachev sufficiently reliable that he was sent as part of Soviet delegations to Western Europe; he made five trips there between 1970 and 1977. In September 1971 he was part of a delegation who travelled to Italy, where they met with representatives of the Italian Communist Party; Gorbachev loved Italian culture but was struck by the poverty and inequality he saw in the country. In 1972 he visited Belgium and the Netherlands and in 1973 West Germany. Gorbachev and his wife visited France in 1976 and 1977, on the latter occasion touring the country with a guide from the French Communist Party. He was surprised by how openly West Europeans offered their opinions and criticised their political leaders, something absent from the Soviet Union, where most people did not feel safe speaking so openly. He later related that for he and his wife, these visits "shook our a priori belief in the superiority of socialist over bourgeois democracy". 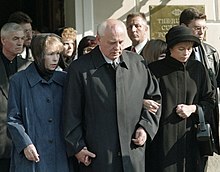 Gorbachev had remained close to his parents; after his father became terminally ill in 1974, Gorbachev travelled to be with him in Privolnoe shortly before the former's death. 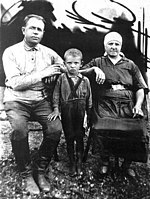 His daughter, Irina, married fellow student Anatoly Virgansky in April 1978. In 1977, the Supreme Soviet appointed Gorbachev to chair the Standing Commission on Youth Affairs due to his experience with mobilising young people in Komsomol. In August 1987, he holidayed in Nizhniaia Oreanda, Ukraine, there writing Perestroika: New Thinking for Our Country and Our World at the suggestion of U.S. publishers. For the 70th anniversary of the October Revolution of 1917—which brought Lenin and the Communist Party to power— Gorbachev produced a speech on "October and Perestroika: The Revolution Continues". Delivered to a ceremonial joint session of the Central Committee and the Supreme Soviet in the Kremlin Palace of Congresses, it praised Lenin but criticised Stalin for overseeing mass human rights abuses. Party hardliners thought the speech went too far; liberalisers thought it did not go far enough. In the early years of his rule, Gorbachev argued that the Communist Party had to adapt to changing circumstances, and engage in creative thinking much as Lenin had creatively interpreted and adapted the writings of Karl Marx and Friedrich Engels to the situation of early 20th century Russia. For instance, he thought that rhetoric about global revolution and overthrowing the bourgeoise—which had been integral to Leninist politics—had become too dangerous in an era where nuclear warfare could obliterate humanity. Gorbachev was self-confident, polite, and tactful; he had a happy and optimistic temperament. He used self-deprecating humour, and sometimes used profanities. Gorbachev often referred to himself in the Third person. His university friend, Mlynář, described him as "loyal and personally honest". He was a skilled manager, and had a good memory. McCauley thought Gorbachev displayed "great tactical skill" in manoeuvring successfully between hardline Marxist-Leninists and liberalisers for most of his time as leader, although added that he was "much more skilled at tactical, short-term policy than strategic, long-term thinking", in part because he was "given to making policy on the hoof". 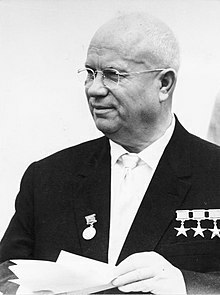 Zhores Medvedev thought him a talented orator, in 1986 stating that "Gorbachev is probably the best speaker there has been in the top Party echelons" since Leon Trotsky. Medvedev also thought Gorbachev "a charismatic leader", something Brezhnev, Andropov, and Chernenko had not been. In 2013, the Lubbock Avalanche-Journal reported a 1992 meeting between Gorbachev and Otis Gatewood, a Christian minister sent with a relief effort for orphans and elderly people in Russia by Churches of Christ in Texas. 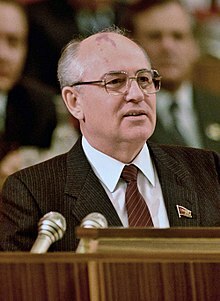 In the meeting, Gorbachev reportedly claimed that he was "indeed a Christian and had been baptized by his grandfather in the Volga River many years before". On 19 March 2008, during a surprise visit to pray at the tomb of Saint Francis in Assisi, Italy, Gorbachev made an announcement which has been interpreted to the effect that he was a Christian. Gorbachev stated: "St Francis is, for me, the alter Christus, another Christ. His story fascinates me and has played a fundamental role in my life". He added: "It was through St Francis that I arrived at the Church, so it was important that I came to visit his tomb". However, a few days later, he told the Russian news agency Interfax: "Over the last few days some media have been disseminating fantasies—I can't use any other word—about my secret Catholicism, [...] To sum up and avoid any misunderstandings, let me say that I have been and remain an atheist". Opinions on Gorbachev are deeply divided. Many, particularly in Western countries, see him as the greatest statesman of the second half of the twentieth century. 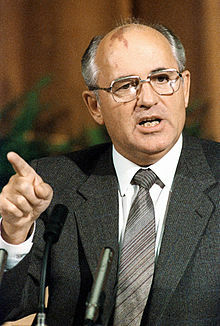 McCauley referred to the presence of "Gorbymania" in Western countries during the late 1980s and early 1990s, as represented by large crowds that turned out to greet his visits, and in the Soviet Union itself opinion polls indicated that Gorbachev was the most popular politician from 1985 through to late 1989. 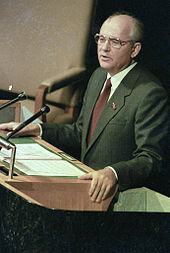 Taubman characterised Gorbachev as "a visionary who changed his country and the world—though neither as much as he wished." His negotiations with the U.S. helped bring an end to the Cold War and reduced the threat of nuclear conflict. 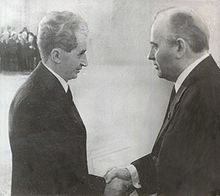 His decision to allow the Eastern Bloc to break apart prevented significant bloodshed in Central and Eastern Europe; as Taubman noted, this meant that the "Soviet Empire" ended in a far more peaceful manner than the British Empire several decades before. 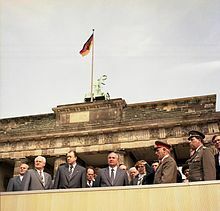 McCauley noted that in facilitating the merger of East and West Germany, Gorbachev was "a co-father of German unification", assuring him long-term popularity among the German people. 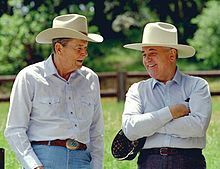 ^ "Gorbachev, Mikhail" (US) and "Gorbachev, Mikhail". Oxford Dictionaries. Oxford University Press. Retrieved February 4, 2019. ^ "Gorbachev". Merriam-Webster Dictionary. Retrieved February 4, 2019. ^ Taubman 2017, p. 313. ^ Taubman 2017, p. 340. ^ Taubman 2017, p. 319. ^ McCauley 1998, p. 92; Taubman 2017, pp. 320–321. ^ Taubman 2017, p. 321. ^ McCauley 1998, pp. 93–94; Taubman 2017, p. 342. ^ McCauley 1998, p. 76; Taubman 2017, p. 367. ^ a b Taubman 2017, p. 386. ^ McCauley 1998, p. 119; Taubman 2017, p. 368. ^ Taubman 2017, p. 369. ^ McCauley 1998, p. 119; Taubman 2017, pp. 369–370. 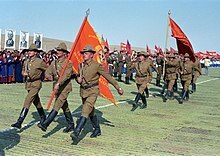 ^ "Russia Bans Party Founded by Gorbachev - NEWS - MOSNEWS.COM". web.archive.org. 23 April 2007. Archived from the original on 2007-04-23. ^ "Reagan funeral guest list". BBC News. 2004-06-10. Retrieved 2019-01-30. ^ "Obama met Gorbachev in run-up to Medvedev talks". Reuters. 2009-03-23. Retrieved 2019-01-30. ^ McCauley 1998, p. 138. ^ "Previous Recipients of Keys to the City | Dublin City Council". www.dublincity.ie. Retrieved 14 December 2017.